Identity, fear, obsession, destruction. Based on his best-selling auto-biography of the same name, Psycho Vertical is a raw and emotive exploration of the complex life and motivations of writer, funny-man and Britain's unlikeliest hero-mountaineer, Andy Kirkpatrick. For more information about the film and upcoming screenings, visit www.psychoverticalfilm.com or get your copy of the film on Vimeo here! Threads from Mongolia follows thirteen women as they explore Western Mongolia. Encounters with eagle hunters, ancient petroglyphs and a glimpse into the lives of nomadic families, Threads from Mongolia weaves female camaraderie, poetry by Claire Carter and music from local performers into a beautiful love letter to a wild place. Made with support from She Went Wild and Women on a Mission. Look out for screenings of the full film on the 2018 Women's Adventure Film Tour. Exploring fear, doubt and sheer determination, this is our video scrapbook of recovery. Made in close collaboration with Hazel Findlay for BMC TV and shot over three years as Hazel went from operating table to fighting fit on the Spanish sport route, Mind Control. The Bothy Project is about exploring the wilds on your own terms, in your own style. Artists Tessa Lyons, Natasha Brooks and writer Claire Carter trek into the vast emptiness of the Sheneval bothy in the Scottish Northwest to let go, unravel, and untangle their need for outdoor space. Find out more about the film and artists involved over at Lowe Alpine. Operation Moffat takes inspiration and wit from the colourful climbing life of Britain’s first female mountain guide, Gwen Moffat. Grappling with her preference for mountains over people, adventure over security and wilderness over ticklists, writer Claire Carter and filmmaker Jen Randall climb, run, scramble and swim their way through Gwen’s most cherished British landscapes. Click here to buy or rent Operation Moffat at Reelhouse. 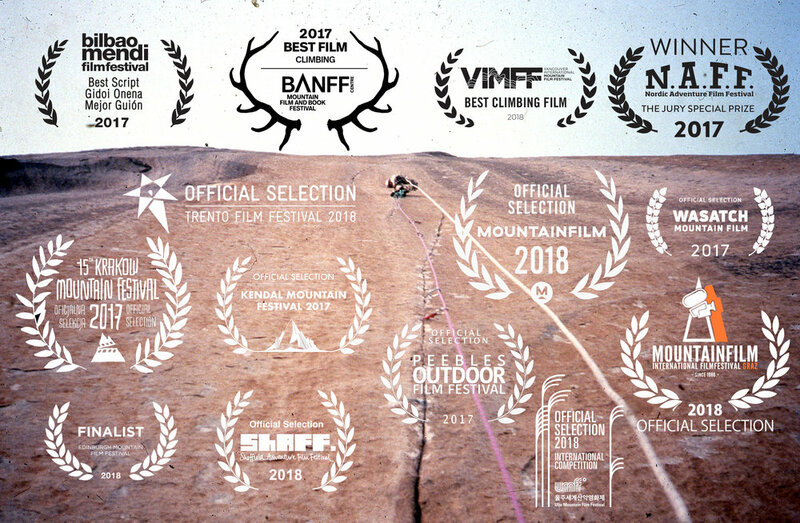 Operation Moffat won twenty awards at international mountain film festivals including Banff Mountain Film Festival, Kendal Mountain Festival, Vancouver International Mountain Film Festival and 5 Point Film Festival. My first leap into doing what I do after studying was making Push It in 2012 - following myself and climbing partner Jackie Sequeira fling ourselves out of our comfort zones by attempting to climb El Capitan - the world’s most famous big wall - and visiting our climbing role models to help us on our way. It’s rough and it’s ready and it’s still one of my favourites. Since 2012, working with young people - teaching them new skills and exploring their creative voices through filmmaking - has been an important part of Light Shed Pictures. For The Old Lie, we worked with a crew of 6 teenage girls and a dance company of 15 teenage boys to create this experimental dance film over 5 wild days shooting in Glasgow’s green (and soggy) places with Firefly Arts and choreographer Natali McCleary.